The Harder They Fall is a great noir with the most common of noir sports-boxing! (horse racing has to be a close second). 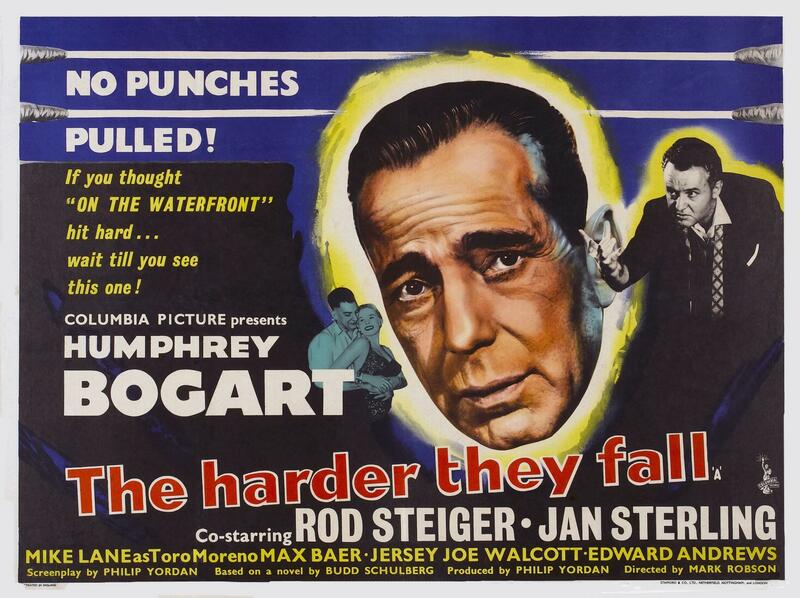 This is Humphrey Bogart’s last film, he was very sick when he made this movie. To see how great an actor he was, find anywhere in the film where he looks like a sick man. If you love Bogart, you will love him in this. This movie also has Rod Steiger and Jan Sterling. This movie is based on a book of fiction written by Budd Schulberg that is actually based on the career of pro boxing champ Primo Carnera. This movie and book are so close to true events that Primo sued to get it shelved. Primo was a giant of a man at 6’9″ and 265 lbs, good-looking and Italian, he was a huge draw at the arenas. Primo went a remarkable 76-6 on his way to winning the Heavy Weight Title in Madison Square Garden. 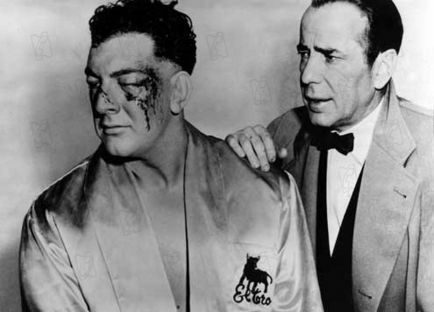 He lost the title 3 fights later to Max Baer also at the Garden. Though nobody really knows the whole truth, but the theory is Primo’s fights were fixed by the mob without his knowledge or consent for most of his career. When he got in the ring with Baer, he was severely out matched, but his heart and pride would not let him be knocked out. He was dropped 11 times in 10 rounds and took a hell of a beating. Primo fought 17 more times with a mediocre record. Primo also went on to become a pro wrestling champion and had a great career doing so. The character based on Primo was played by Mike Lane who physically matched Primo. Lane also had a career in pro wrestling as well as a few more movies. Lane’s character is Toro Moreno and was from Argentina instead of Italy. The Max Bear character was actually played by Max himself and went by Buddy Brannen. We also see boxing great Jersey Joe Walcott in the role of a trainer. Bogart’s character was also based on a real person by the name of Harold Conrad, who was a colorful writer and promoter. This movie tells an amazing story and when I found out it is based in reality, it’s even more fascinating. Though I know Requiem for a Heavyweight is not a noir film, I watched it soon after seeing The Harder They Fall and seen some similarities. Though I could not find any information to show this, I have to feel that the writers of Requiem got some inspiration from Primo’s career as well. Requiem is also a great movie worth watching. It is a shame this movie doesn’t get its due respect, I know Bogart is one of, if not the best actor in film history, and had a lot of great movies, you really don’t hear much about this film. This movie has a great rating of 7.6 on IMDb but only has 4300 votes. It also has 100% Rotten Tomato rating, but only 10 reviews counted. I don’t know how high on the list of Bogart film I would put this, but it is a great movie worthy of your viewing.